GCA Altium acted as exclusive financial advisor to Eurosicma, a leading independent manufacturer of automatic machines for horizontal flowpack and fold packaging, on the sale of 60% of its shares to IMA Group, listed on the Milan Stock Exchange and a world leader in the production of systems for the processing and packaging of pharmaceuticals, cosmetics and food. Founded in 1965, Eurosicma is a family-owned Italian packaging company with a long-established leadership in niche markets such as candies, biscuits and noodles in the food industry, and plasters and cotton buds in the pharma and personal care sector. Eurosicma has a global presence with more than 95% of its turnover generated abroad. Eurosicma expects around €27 million sales and a €4.5 million EBITDA in 2017, with a good potential for growth, thanks to the overall support to be provided by IMA as a part of the integration process. 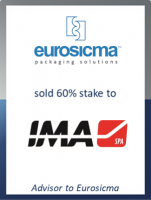 For IMA, the transaction entails an outlay of some €26 million for the 60% shares of the company, and the signing of put & call options on the remaining 40% to be exercised by April 2027. Carlo Dawan, Managing Director at GCA Altium, commented: "I am convinced that IMA is the ideal partner for Eurosicma and that this acquisition will add value to both companies. While Eurosicma has gained a solid leadership in niche markets which will be further strengthened by the synergies with IMA group, IMA is also successfully pursuing its consolidation strategy in the food sector." This deal adds to GCA Altium’s track record in the packaging machinery field, after successfully advising on the acquisition of Ilapak by IMA in 2014.